RAW files are unprocessed image files created by digital cameras. The difficulty of opening RAW files is that most digital cameras adopt their own exclusive formats for storing RAW images, including but not limited to NEF(Nikon), CRW(Canon), ARW(Sony) and RAF(Fuji). Until the day when all major manufacturers agree using a unified format, we still need special solutions for opening RAW files without spending money on paid RAW file viewers. Luckily, in this tutorial, you will learn 2 methods to open and view RAW files in Windows computer free. Camera codec works as a translator between Windows computer and RAW files. Camera codecs are usually provided by camera manufacturers and software developers. For example, Microsoft supplies Windows Camera Codec Pack for Windows XP and later versions of Windows computer, which supports some specific cameras by major digital camera brands. RAW file viewers, including Adobe Photoshop, use RAW plug-ins, but the abilities vary. Another drawback is that the operating system will still not allow thumbnail preview for RAW files. Of course, manufacturers only offer codecs for specific RAW file formats. These codecs can be installed to Windows computer, so the operating system will display thumbnail preview and open the specific RAW file with built-in photo viewer. Now the problem is how to install the right codecs. In this method, we are going to introduce how to download and install Windows Camera Codec Pack and codecs by manufacturers. Freeware for viewing RAW files will be recommended in the next method. Windows 10 users may have realized that they can open some RAW files, like CR2 and ARW. It is because Windows Camera Codec Pack is preinstalled in Windows 10. If you are using Windows 8 and Windows 7 or earlier OS, please follow steps below to download Windows Camera Codec Pack. Step 1. Visit Microsoft website and search for “Camera Codec Pack” in the search bar at top right. Step 2. From the search result, click the first option and Microsoft’s download center will open. Step 3. Look through the information, then click on the Download button. Step 4. On the new page, select the right msi. file according to your Windows version, then click Next. Step 6. After it’s done downloading, open the codec pack and follow the setup wizard to install it on your computer. You need to restart your system in order for the codec pack to work. Once the system is rebooted, you will notice the icons of RAW files are changed to thumbnails. 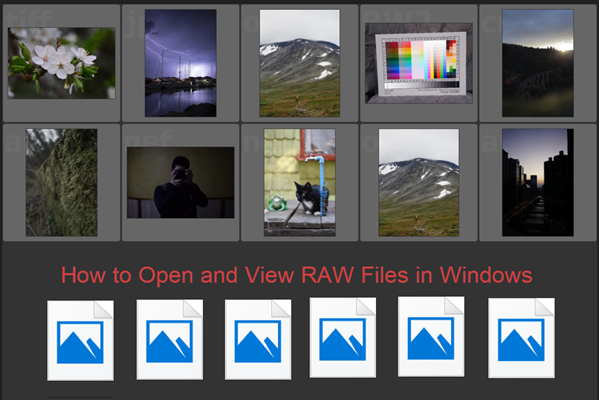 Now you can open RAW files with Windows Photos app. Since Microsoft has stopped updating the Camera Codec Pack, it is possible that even Windows 10 computer is not able to open some RAW image files. In this case, we can install specific camera codecs from digital camera manufacturers. Camera codecs can be found on manufacturers’ website, or third-party sites. We will take the latter option as an example to show how to install Nikon NEF codec. Step 1. Visit www.free-codecs.com on your computer browser. Step 2. Type “Nikon NEF Codec” on the search bar at the top right and press enter. Step 3. Click on the “NEF Codec 1.31 free download” option from the results. Step 4. Click on the Download button on the right section and click again on the download button at the new page. Step 5. Click on the downloaded exe file and follow the setup wizard to finish the installation. Step 6. Restart your computer system. Once the process is completed, you should be able to open the specific RAW file with Windows Photos app. Both of the two options in this method will change the icons of RAW files into thumbnails in Windows File Explorer. This would be a perfect result if it works, but you can also keep reading another method below, especially when you are not using a Windows computer. If you failed to find the right codec to view RAW files, you can also resort to RAW file viewers. It would be better to be freeware, of course. Here we are going to recommend several free RAW file viewers. Please note that some RAW files will still need RAW loader or plugin to be installed, but you will get links or instruction from the RAW file viewers to finish the task. The list is short, but any one of the 3 free RAW file viewers will help you open RAW files easily. Additionally, you can view detailed metadata with darktable, manage RAW files between camera and external storage devices with digiKam, and edit RAW files with GIMP. Besides the difficulty of opening RAW files, RAW photo recovery is also a common problem. Luckily, with a free photo recovery software, it will never be a problem to recover deleted photos from Fujifilm, Canon, Nikon or other digital cameras. If you have any question as per how to open RAW files, RAW file viewer or RAW file recovery, please feel free to tell us in the comment area.